Sadie is loving her guitar and inukshuk from Painted Turtle Wooden Toys. The quality of the toys is just what any parent would want for their child. My dad who makes things out of wood was very impressed with the make. I also got to review the Rattle and Teething Ring. When Sadie was teething it seemed like I could never find the right thing for her to chew on…it was either made of plastic which I tried to stay away from, to big for her mouth or the wrong shape. And she was never one to like the cold frozen facecloths. 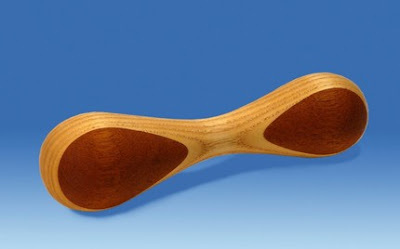 This 6″ rattle is easy to grasp for little hands. It comes in 3 different combinations of your choice. It retails for $18.95 and recommended for babies 7 mths and up. It is light weight with unpopped popcorn kernals that are inserted at the beginning of the process so there is no chance for the toy to come apart. It is sanded down to a super soft finish with food-grade hempseed oil to bring out the different wood tones. The Rattle complies with the Canadian Safety Standard for rattles. 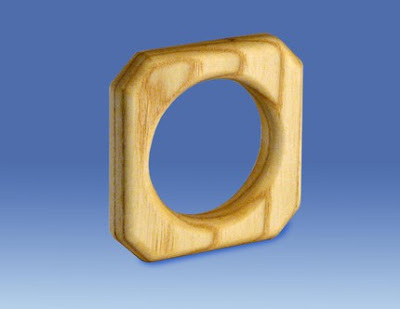 The Teething Ring is made out of one solid block of white ash and sanded down to a silky smooth finish. Its shape makes it easy for little babies mouths to chew on. The piece is finished with again, food-grade certified organic hempseed oil so it is safe for teething babies from 4 mths up. It is light weight and easy to grasp.